"The Radio Times is a British institution and redesigning it is like taking on a remodel of the red post box or London bus, but its latest incarnation doesn’t deviate far from its roots and it does well to stay true to tradition. Now billed as the ‘ultimate digital TV and radio guide’, the redesign seeks to increase digital coverage. This is reflected throughout TV and radio and even sees the addition of weekly picks from the web and YouTube. 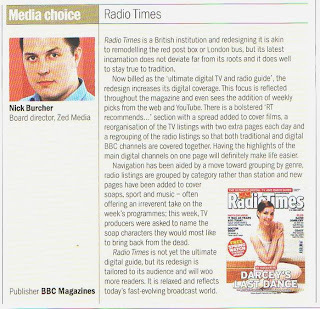 There is an increased ‘RT recommends…’ section (a second spread added to cover films), a reorganisation of the TV listings with 2 extra pages of listings each day and a regrouping of the radio listings so that each spread covers both traditional and digital BBC channels. Having the highlights of the main digital channels on one page will definitely make life easier! Navigation has been aided by a move towards genre grouping (eg Radio listings grouped by category rather than station) and new pages have been added to cover Soaps, Sport and Music - often irreverently. This week TV producers were asked to name the soap characters they’d most like to bring back from the dead, surprisingly Neighbours’ Helen Daniels is not highly featured. I’m not sure Radio Times is the ultimate digital guide yet, but its redesign is cleverly tailored to suit its audience and will woo more readers as well. The overall feel is more relaxed and the Radio Times now better reflects today’s fast evolving broadcast world."